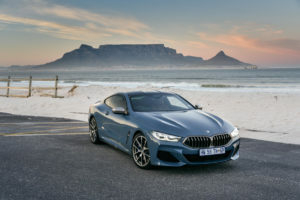 BMW Mzansi has launched its ultimate Grand Tourer in the form of the M850i xDrive Coupe which also introduces BMW’s new M50i engine locally. Number 8 at BMW represents the ultimate in Coupe, Convertible or Roadster with the first 8 Series model launched in 1990, a model that revived supercar looks (remember the pop-up headlamps) first seen on the M1 Supercar. 2000 saw the launch of the Z8 Roadster which featured in James Bond’s “The World is not enough”. After a 14 year hiatus in BMW using the number 8, we then saw the introduction of the i8 Plug-in Hybrid which rendered bystanders motionless with its futuristic lines and butterfly doors. Now we have a new 8 in the BMW line up with the local introduction of the BMW M850i xDrive. The BMW 8 Series features a low-slung design, an elongated silhouette with a slim window graphic and a roofline flowing elegantly into the rear with distinctive “double-bubble” contouring. The front gets BMW’s hexagonal shape kidney grille placed low down in the with LED headlights in the slimmest design of any BMW to date. For buyers seeking added headlight illumination, BMW Laserlight with variable road illumination and Selective Beam is optionally available. Beneath the headlights are large air intakes, an M Sport design feature, seating on either side of the centre air intake with a front spoiler that reduces axle lift in high speed. All these combined with the bonnet lines create an imposing frontal appearance, “Suka ku fast lane” type of look. On the side, the M850i xDrive gets 19-inch M light-alloy wheels (20-inch wheels optional) with high-performance tyres with M Sport brakes visible in their blue brake callipers. Behind the front wheels are air curtains that aid aerodynamic efficiency. The flared wheel arches in combination with the strikingly tapered glasshouse create a muscular shoulder line. The rear gets L shaped LED lights, vertical side vents on the outer parts on the lower bumper with trapezoidal twin exhausts seating on either side of a faux diffuser. The overall look of the BMW M850i xDrive is that of a Coupe with striking vertical and horizontal lines in a low slung sporty design, something that will surely make it stand out in traffic. 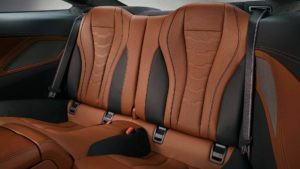 The BMW 8 Series is a strict 2+2 seater GT and the rear backrest can be split 50:50 as standard and folded down to increase the capacity of the 420-litre luggage compartment. The door shoulders, a driver-oriented dash is finished in leather whilst the electric adjusted Vernasca leather lined sports seats also come standard. The 10.25-inch Control Display Infotainment Touchscreen works in conjunction with an iDrive controller, gesture control, voice control or by using buttons on the steering wheel. Navigation, Bluetooth, USB/Radio/Streaming, Harman Kardon Sound all come standard. BMW’s Heads Up Display and Live Cockpit Professional comes standard with the instrument cluster featuring a fully digital 12.3-inch display with a navigation map. BMW Connected personal mobility assistant is available with digital services available including hazard warnings obtained from interconnectivity with other BMW vehicles, “over-the-air” software upgrading, the integration of Microsoft Office 365 and Skype for Business, as well as the BMW Digital Key, which allows customers to unlock the vehicle and start the engine using a smartphone. 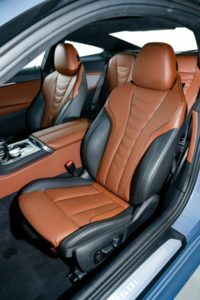 Options include the BMW Display Key, telephony with wireless charging, climate seats, the Bowers & Wilkins Diamond Surround Sound System, as well as glass applications for selected controls. Moreover, there is a choice of model-specific options from BMW Individual. 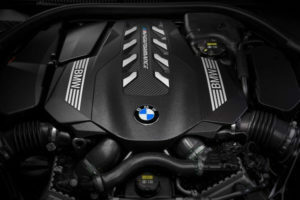 Powering the BMW M850i xDrive is a newly developed 4.4-litre TwinPower Turbo V8 which has a 50kW power increase over the unit it replaces resulting in 390kW/750Nm of power for a 0-100km/h sprint in 3.7 seconds topping at a limited 250km/h top speed. Fuel efficiency is claimed at 10.5l/100km. An eight-speed Steptronic Sport transmission comes standard with steering wheel mounted shift paddles for manual control. A sports exhaust enhances the V8 bass and allied to the varying Driving Modes (EcoPro, Comfort, Sport & Sport+) can give the Coupe some exciting burst sounds on up change with crackles on the overrun or during down changes (WELL done BMW). The rapid acceleration is largely due to the xDrive all-wheel-drive layout which is rear drive biased for that exciting driving experience. The electronically controlled rear differential lock, Adaptive M suspension with electronically controlled dampers comes standard and ensure a varying driving feel depending on driver mood. The optional active roll stabilisation feature endows the car with even sportier handling characteristics. BMW driver assistance systems include Active Cruise Control with Stop & Go function, the Steering and lane control assistant, the Lane Change Warning and Lane Departure Warning systems, the Lane Keeping Assistant with side collision protection and evasion aid, BMW Night Vision, as well as the Crossing traffic warning, Priority warning and Wrong-way warning systems. Multi airbags, braking and stability enhancement systems also come standard. 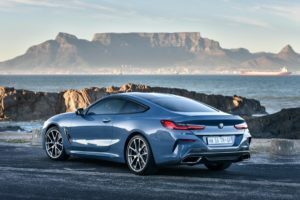 The 8 Series Convertible, 8 Series Gran Coupe will be added to the line up in the 3rd Quarter of 2019 whilst for those that seek more performance, the M8 line up (Coupe, Convertible and Gran Coupe) will also be launched in Mzansi in the 4th Quarter of 2019. 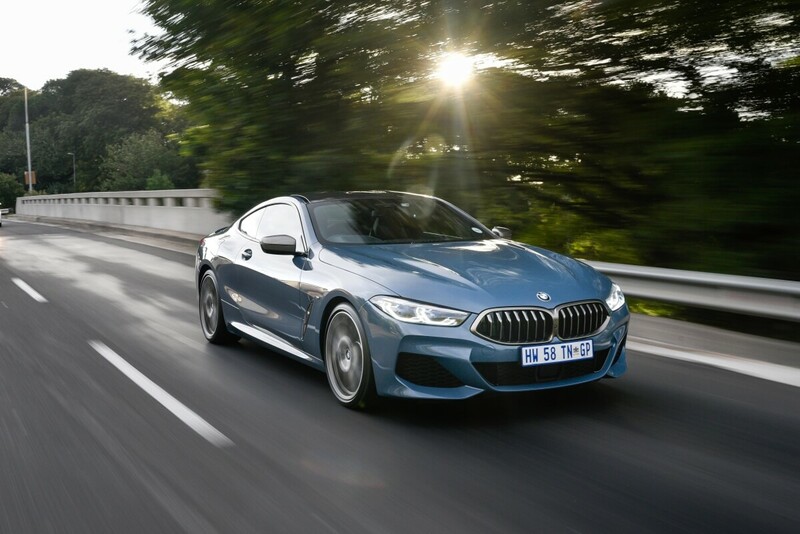 Like all BMWs sold in Mzansi, the BMW M850i xDrive comes with a 5 year/100 000km maintenance plan with a 365 day, 24 hours a day BMW On Call cover.